October 28, 2016, 1:33 p.m. 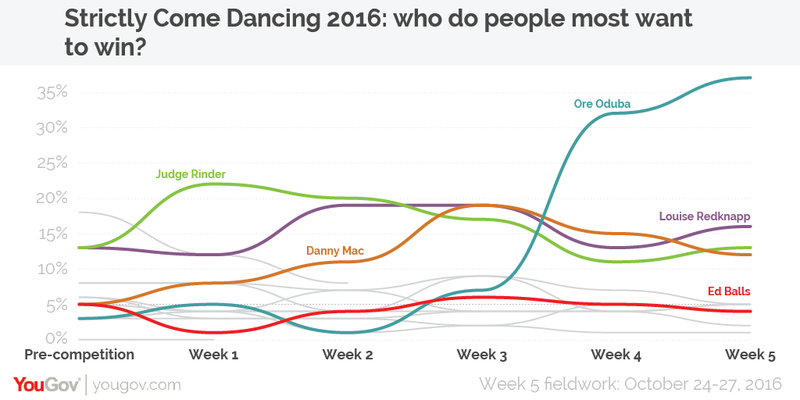 He has “danced” his way into the nation’s affections but YouGov’s latest Strictly tracker suggests that Ed Balls’ journey is running out of road. The former shadow chancellor is facing twin problems when it comes to staying in the competition. Firstly, he is suffering from a decline in the number of viewers who think he is likely to win and a fall in the proportion of those who want him to prevail. Only 4% would like him to win, down on both last week and the week before that. In terms of how many viewers with an opinion believe he will win, he has been stuck on 1% for the past month. Secondly, he is running out of people below him in the rankings to fill up the positions in the dance-off. In terms of who the public want to prevail, he only has Anastacia and Laura Whitmore below him and when it comes to which contestant viewers believe will lift the glitterball trophy he is level with Anastacia wat the bottom of the rankings. Of course, when it comes to who goes this weekend a lot depends on the performances and the judges scores. 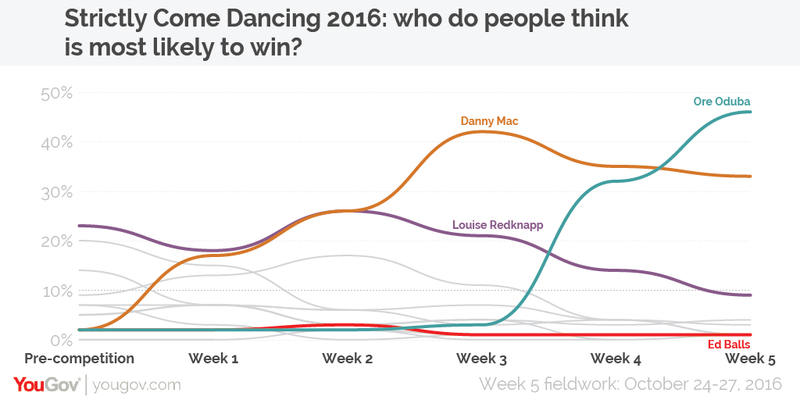 However, if it were just down to viewers’ opinions going into this weekend, it would not be a surprise if Sunday’s dance-off was between any two of Ed Balls, Anastacia, Greg Rutherford and Laura Whitmore. Given his scores with the judges to date, it would be a shock if Ed survived being in the bottom two. Meanwhile, at the top of the leader board it is now a clear three-way race between Louise Redknapp, Ore Oduba and Danny Mac, with BBC Sport presenter Ore in pole position.